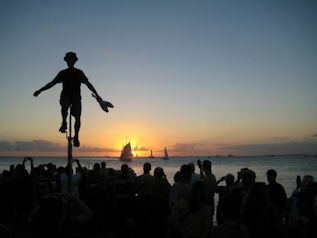 One time honored tradition that everyone who has the chance to visit Key West should experience is a Mallory Square sunset celebration. Locals started gathering at the Mallory location dating back to the 1820's. It was there that they shared gossip, news and shopped their wares. 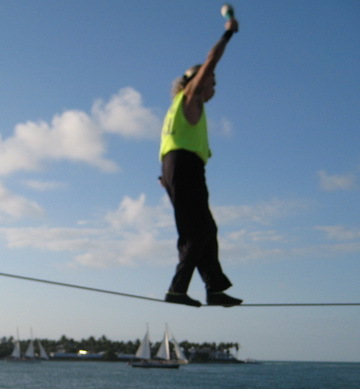 Fast forward 200 years later and you will find that this Key West attraction has exploded into an incredible event. 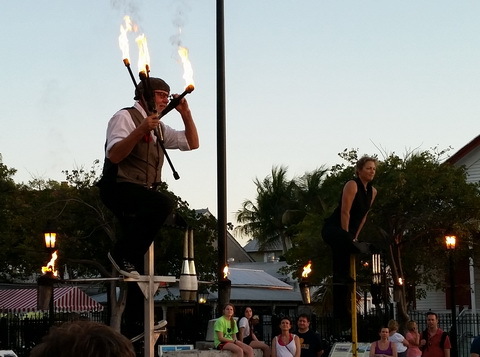 Thousands of people gather each evening at Mallory Square to get a front seat view of the sunset and to experience all the festivities and entertainment that this fun event offers. 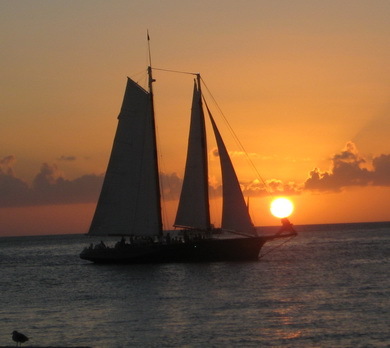 Mallory Square is located on the farthest west side of Key West which makes it an ideal if not perfect location to view an amazing Key West sunset. There's not many places on earth where you will get a chance to see a sunset as spectacular as what you may experience at Mallory Square. The square is also situated just one block away from the north end of Duval St., which also happens to be where most of the night life action takes place. The sunset celebration is a great place to take the entire family for a cheap afternoon out. Between the numerous street vendors and performers there's always something that appeals to every age group. 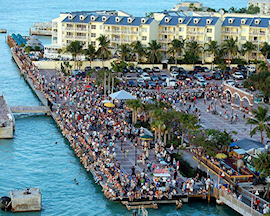 Arts & crafts lovers will certainly appreciate the Mallory Square sunset celebration. There are many small vendors who show up at Mallory Square a couple of hours before sunset to display and sell their offerings. There are also a number of food & beverage vendors that are in attendance all of which help give the event a carnival atmosphere. There are numerous street vendors at Mallory Square. 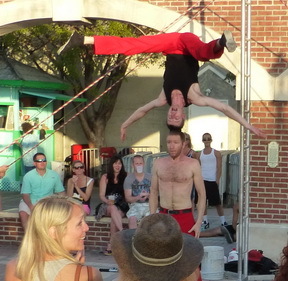 See world class street performers. 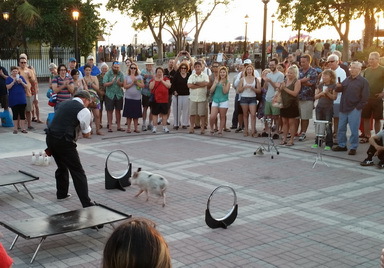 For most travelers the number one attraction to Mallory Square are the many street performers who show up to entertain the crowds. Starting about two hours before sunset the performers will begin setting up to perform their acts. Many of the acts are amazing and maybe the best you will find anywhere outside of the Barnum & Bailey circus. You will see everything from knife jugglers, sword swallowers, comedy acts, high wire acts, singers, unicycle acts and animal acts to name a few. Be sure to flip the performers a few bucks following their act since this is how most of the entertainers make their living. Apparently this street performers mother forget to mention never to play with fire. 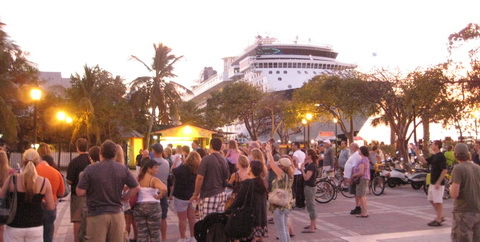 Mallory Square is located right next to where the big cruise ships dock. 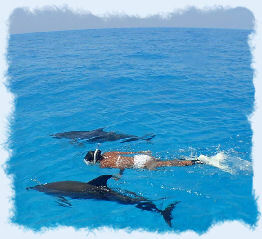 If you have young children be sure to give them a close up view of the grand ships, they will enjoy the experience. There are a large number of fantastic restaurants and plenty of shopping in close proximity to the square, so be sure to check out the neighborhood.